Home NEWS Free ‘Squash’ Now! “We need to know what’s happening. They have him locked up from when, and we can’t hear nothing at all. Nobody is talking to us – the police, the Minister of National Security, nobody. He is our family’s breadwinner and since being in lockup, we have been suffering.” These are the words from frustrated and concerned relatives of rising Dancehall artiste, 27-year-old Andre Whittaker, more popularly known as ‘Squash’, who has been in police lockup since August 8, even after allegedly being declared a free man by the court. His family has reason to believe, in the absence of an official explanation from the security forces, that Andre is being punished for something he has no control over – being brother of the deceased Daniel Whittaker, otherwise called ‘Dan Dan’, whom the police reported as the leader of the feared G-City Gang. ‘Dan Dan’, who had, at the time, been under the police radar for his alleged involvement in a number of murders and shootings, was reportedly killed in a shootout with the police in Bottom Melbourne, Salt Spring, St. James. This, Andre’s relatives believe, is the sole reason the police have insisted on releasing him from the Freeport Police lockup. “He’s an entertainer, and he has been an entertainer since 2009, that’s what he does for a living. 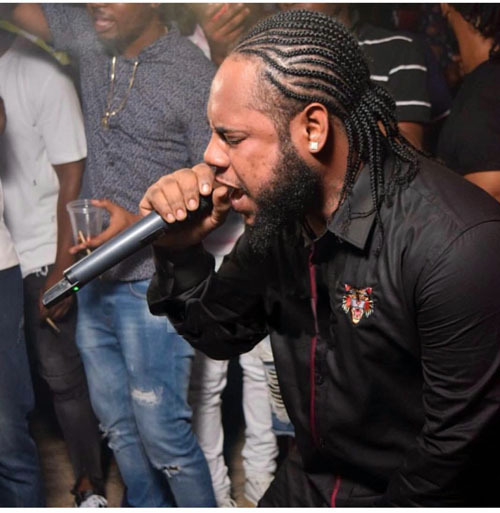 The senior Whittaker explained that after performing at a show in Spanish Town, St. Catherine, ‘Squash’ was arrested, along with two of his producers, on charges of being involved in some 13 murders – charges which were vehemently denied by the aspiring dancehall artiste. After being tried, he was released in June, according to his father, and went back to doing what he loved – performing and making music. Trouble struck shortly after, however, as after settling back into his routine as an artiste, ‘Squash’ was again detained by police in St. James in August, this time without a proper explanation given. Whittaker explained that after the first instance of being locked up and released, he was happy to see his son, and so were his entire family and his growing fan base. “Everybody was happy to see him; people kept asking about him and kept requesting him for shows, so we were all happy,” the senior Whittaker said. It’s been more a case of confusion, however, as now, they cannot sufficiently explain to fans why the budding DJ has not been able to turn up for the over 20 shows he has been booked all across Jamaica and the wider Caribbean. “Look at this,” Andre’s sister, who requested to remain unnamed, said, showing a phone with a number of emails requesting Andre for shows. In the list of emails were also queries about what had happened to the much-sought-after artiste, after he failed to show for slots he had been booked for as a result of being detained. “He is losing so much because of this. It’s a huge loss of income, and it’s taking a hit on his reputation. He is losing a lot of money and as a result, with him being the main breadwinner of our family, we are suffering,” his visibly frustrated sister said. It was revealed to the Western Mirror by Andre’s relatives that he could have been released up to two weeks ago, but that Minister of National Security, Dr. Horace Chang, refuses to sign a letter that would guarantee Andre’s release. Whittaker’s family is still maintaining that he is innocent and is being unfairly punished, and they are not certain how much longer the family will be able to survive without him at the helm as their breadwinner. It was reported that ‘Squash’ had a number of shows scheduled for this month, which have all had to be cancelled. Andre’s mother, Shelly-Ann Milwood, is equally distraught at the situation surrounding her son, and in a letter to the Western Mirror, is requesting that justice be served to him, and that he ought not to be treated like a criminal. It is uncertain how long Andre ‘Squash’ Whittaker will remain in police lockup.